The Sabadell Financial Center is an office building in downtown Miami, Florida, USA. The tower is 430 ft (131 m) in height and contains 31 floors. It is located in the northern Brickell Financial District of Miami, on Brickell Avenue and Southeast 12th Street. Built in 2000, the building consists of over 95% office space, while the ground floor is dedicated to retail. Metropolitan Miami is a complex of four skyscrapers in the central business district of Downtown Miami, Florida, United States. These are Met 1, Met 2 Financial Center (officially the Wells Fargo Center), Met 2 Marriott Marquis and Met 3. Met 1 was finished in 2007, Met 2 was completed in early 2010, and Met 3 is currently under construction for completion in 2011. Met 1 was the first building to be completed in the complex. 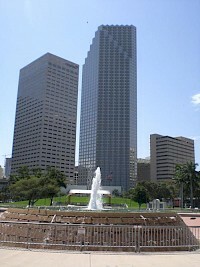 The Miami Center is a skyscraper in downtown Miami, Florida. Although not even close to being one of that city's tallest buildings, it is a symbol of early downtown. Built in 1983, it is older compared with most of the taller buildings in Miami, which have been built in the last decade. In addition, the Miami Center is immediately adjacent to Bayfront Park, and is unobstructed when looking at the skyline from Miami Beach to the east. The building is 484 ft (148 m) tall and has 34 floors. 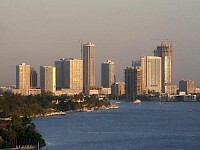 Miapolis is a proposed skyscraper planned for construction on Watson Island in Miami, Florida. If approved, constructed, and completed the building would stand at 3,200 ft (980 m), with 160 floors, surpassing the Burj Khalifa in Dubai as the world's tallest skyscraper. The Omni Development is a proposed residential complex that is planned for construction in the Downtown region of Miami, Florida. The complex will consist of 6 residential high-rises, each rising at least 500 feet (152 meters) tall. Each building is being designed by the Arquitectonica design firm, and the complex is being developed by Kimley-Horn and Associates. The project's groundbreaking is scheduled to take place in early 2008, and is slated to be completed by 2011. 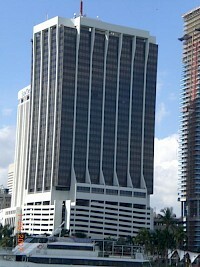 One Bayfront Plaza is a skyscraper approved for construction in the U.S. city of Miami, Florida. If completed, the building would stand at 1,049 feet (320 m), with 80 floors. One Bayfront Plaza would primarily consist of offices, but also would include a retail mall on the lower levels. The entire project consists of over 2,000,000 square feet (200,000 m) of Class A office space. One Bayfront Plaza is the first skyscraper over 1,000 feet (300 m) to be approved in Miami. One Biscayne Tower is an office skyscraper in downtown Miami, Florida. It is located on the eastern edge of the Central Business District, on South Biscayne Boulevard. It is comprised completely of Class A office space. The building contains 39 floors and is 492 ft (150 m) tall, to the roof. The 200-foot (61 m) antenna on top of the building raises its total height, including antenna, to nearly 700 feet (210 m). One Broadway is a residential skyscraper in the City of Miami, Florida, United States. It is located in Downtown's southern Brickell Financial District, an area of increased density with the recent building boom in Miami. The 42-story tower was completed in 2005, and is located at 1451 South Miami Avenue, two blocks west of Brickell Avenue. The building is near Southeast/Southwest 15th Road, which is known as Broadway in Miami. 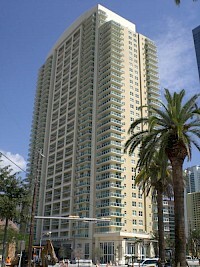 One Miami is a complex of two adjacent skyscrapers in downtown Miami, Florida named One Miami East Tower and One Miami West Tower. It consists of two towers located at the Miami River delta, where the river empties into Biscayne Bay. The East Tower is the taller of the two, at 460 ft (140 m). 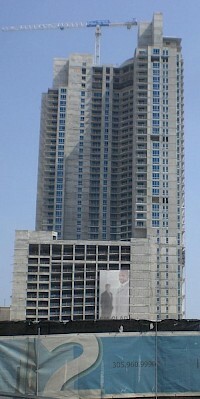 It contains 44 floors, and was completed in 2005. The West Tower is 449 ft (137 m) tall, and contains 45 floors. It, too, was completed in 2005. The Opera Tower is a residential skyscraper in Miami, Florida, United States. 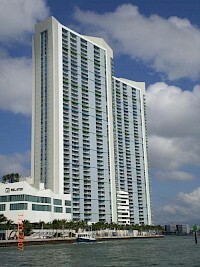 It was developed by Florida East Coast Realty, and was completed in late 2007. The Opera Tower received its temporary certificate of occupancy on December 26, 2007. The 60-story tower is located at 1750 North Bayshore Drive in Media and Entertainment District, just north of Downtown Miami, and contains 635 luxury condominiums. Resales for condominiums units were handled by Vistas International Realty.